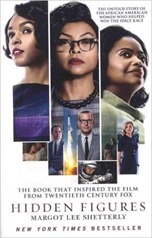 Hidden Figures by Margot Lee Shetterly tells the story of Africa American women who worked as “computers” at NASA and its predecessor NACA during and after the Second World War. The Hidden Figures worked initially in the West Area Computing Group at the NACA Langley Research Centre in Hampton, Virginia, which did reseach on aircraft and then rocket design. The Computing groups carried out calculations at the behest of engineers from around the Centre, this was at a time when calculation was manual or semi-manual compared to today. Over time they were co-opted directly into research groups, some of them to ultimately become engineers. The West Computing group was mirrored by the East Area Computing Group – comprised of white women. There is some history for women acting as “computers”, and the necessity of World War II led to the government taking on Africa American women for the job, in face of historic segregation. For African American women this was a rare opportunity, until then the only recourse for African American woman with advanced training in maths was teaching. For a very few the Computing group ultimately acted as a stepping stone to working as an engineer. Shetterly sees these women as a vanguard to the African Americans in the modern US who have every opportunity open to them. This jars a little to me when I see constant news from the US of, for example black people being more likely to be killed by the police, or a senior African American being brought together by the President with the policeman that aggressively interviewed him on his doorstep because the house looked too nice to belong to a black man. Or African Americans being purposefully disenfranchised. The shocking thing to me, as a Brit, was the degree to which US society was absolutely, formally segregated on racial grounds. In Virginia, where this story is set, segregation was preserved by the Democratic Party (perhaps some explanation as to why African Americans are not necessarily whole-heartedly Democrats). In Prince Edward County, Virginia they went as far as shutting down all the public schools for 5 years in order that black and white children would not be educated together – white children were given grants to study at private schools. Britain may have been racist in the past, it may still be racist today but it never enshrined it so deeply and widely into law. In response to this Africa Americans ran a parallel community, segregation didn’t end because the segregation laws were repealed. It ended because African Americans saw the end of those laws as a door ajar which needed a serious push to pass through. Thus when Rosa Parks sat on the bus, Katherine Goble (from this book) went to university and Ruby Bridges went to school they didn’t do so entirely alone. They had the support of their community and the organisation of the NAACP to help them. They had to be twice as good as a white person to get the same job. At the same time they also saw themselves as representatives of their race, and examples to their children. When you look at a man the age of Donald Trump, 70, it’s worth bearing in mind that his teenage years were spent during the end of segregation by law and his parents were the white generation which fought so hard to keep it. The focus of the book is mainly the personal lives, and ambitions of the women. There is some description of the work they, and the Research Centre did, but not in any great depth. The book highlights again the transformative effect of, particularly, the Second World War on society in the US. The seeds of theses changes could be seen after the First World War. This mirrors similar changes in society in the UK. Once “computing” became the realm of high capital machinery the importance of women as computers waned, high capital machinery being the preserve of men. We see the consequences of this even now. The book finishes with the part Katherine Johnson, in particular, played in John Glenn’s first trip into orbit and her subsequent work on the Apollo moon landing and Apollo 13 recovery. Shetterly emphasises the legacy of this group of women that normalised the idea that Africa American women could ultimately become engineers, scientists or any other sort of professional. Interestingly my wife and I disagreed on the prominence of the men on the cover of the book (see above). She thought they were central and thus important, I thought they were small and thus unimportant. In the text the men are bit-part players, they are husbands and sons, or drift in and out of the narrative having spoken their line. 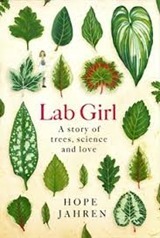 Lab Girl by Hope Jahren is an unusual book. It’s an autobiography which mixes in a fair amount of plant science. It is beautiful to read. It is strong on what being a scientist means. The closest comparison I can think of are Richard Feymann’s “Surely you are joking, Mr Feynmann” memoirs which are rather more anecdotal. Lab Girl is chronological, starting from Jahren’s early memories of visiting the lab in her father’s school after hours but then fast forwarding to her academic career setting up laboratories in Georgia, Baltimore and finally Hawaii. It isn’t encyclopaedic in providing a detailed record of Jahren’s personal and scientific life. A thread through the whole book is Bill, her trusty research assistant. Bill starts as a keen undergraduate who Jahren takes on when she gets her first academic position. I think in some ways Bill is something of a product of the US academic system, with support staff often funded on short term grants. In the UK such people tend to be employed on a permanent basis by the institution. My Bill was Tom when I was a PhD student, Pete and Roger when I was an assistant director of research. As a lecturer I didn’t have a Bill, and maybe that was my problem. Several themes intertwine through the book. There is the day to day activity of a lab: labelling things, repetitive sample preparation, measuring things, fighting with equipment to get it to measure things. Wrangling undergraduates and postgraduates. There are trips out into the field. For Jahren, as a biologist, the field is very literally the field (or Irish bog, Canadian tundra etc). There is attending academic conferences. Mixed with this there is the continual struggle for tenure and funding for your research and the fight for resources with grants that don’t go quite far enough. It’s fair to say Jahren put in an awful lot more hours than I did as a young academic but then I didn’t turn into an successful, older academic. Make of that what you will. It’s difficult to measure your success as an academic, grant applications are so hit and miss that winning them is only a measure of your luck and skill at writing grant applications, papers are relatively sparse and rarely provide much feedback. Sometimes putting in hours seems the only way of measuring your worth. A second strand is plant biology, mingling basic background and the cutting edge research that Jahren does. I absorbed this in ambient fashion, I now think a little more like a tree. I didn’t realise that willow deliberately drop whole branches so as to propagate themselves. This explains the success of our willow dome construction which was made by unceremoniously plonking willow sticks into the ground and weaving them together. They then gamely got on and grew. Soil is a recurring theme in the book, the teaching of the taxonomy of soil to undergraduates in particular. I had glimpses of this rich topic whilst doing a Kaggle challenge on tree cover. Finally, there is mass spectroscopy and isotope analysis. And finally there is the personal, Jahren’s mental health, her struggles with pregnancy, marriage and a growing son. Some of this is painful and personal reading but its good to hear someone saying what we perhaps find unsayable. Lab Girl says relatively little about the difficulties she particularly faced as a woman, although Jahren has written about it elsewhere. I observed a while back when reviewing In Defence of History that whilst historians seemed interested in literary style in technical writing, scientists rarely did. Lab Girl is an exception, which makes it well worth a read. At the end of the book, Jahren asks us all to plant a tree. I pleased to say we’ve achieved this, although perhaps not quite the right sort of trees for American sensibilities, used to larger gardens. In the front garden we have a crab apple tree which, in the right sort of year, flowers on my birthday. There are several apple trees spread through the front garden. In both front and back gardens we have acers and now, at the bottom of the garden we have an amelanchier. I have longed for a Cedar of Lebanon in my front garden but fear I will never own a house large enough for this to be practicable. 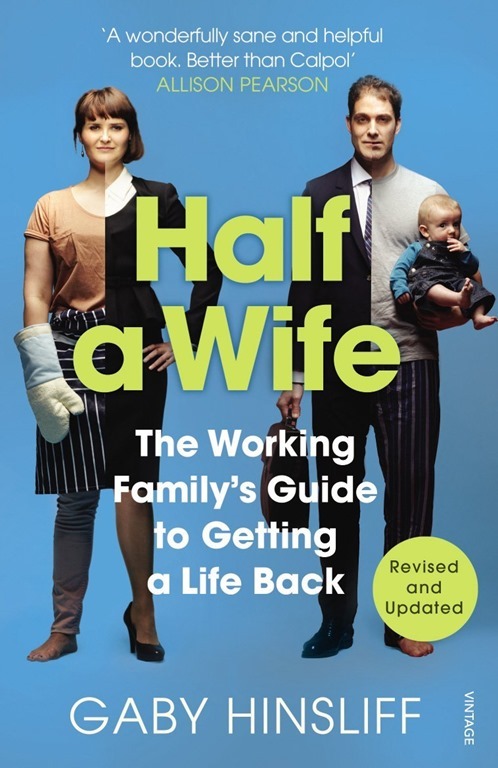 Half a Wife: The Working Family’s Guide to Getting a Life Back by Gaby Hinsliff, is a proposal as to how families can live their lives. The title sacrifices clarity for a catchy headline. 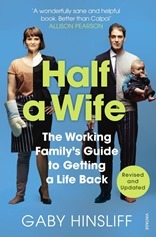 The “half a wife” is a reference to the fraction of her time Hinsliff wanted to be a full-time mother, or rather the collective target that she, and her husband would aim to achieve. Mrs SomeBeans and I have accidently hit this target – I work full time, Mrs SomeBeans works 2.5 days per week. As a society we’ve moved away from the traditional family of a full-time employed (male) breadwinner and a full-time (female) housewife. This model used to be enforced firmly. In the early 1970s, when she fell pregnant with me, there was no question my mother would leave her job and wouldn’t be coming back. In fact when my brother and I were small, a local garage refused to give her a job application form because she had children. My mothers experience was not unusual. But by 1983 two thirds of mothers stayed at home to bring up their children, by 2010 only one third were doing so. This shift is a result of a societal change with a macroeconomic benefit – more workers make a more productive economy. It has been facilitated and encouraged by government policy. Half a wife addresses how we might cope with this change. It is written from the point of view of someone getting a “London premium” by moving out of London, whose reduced income just goes over the line into the upper rate of tax and who seems pretty talented. Things not available to all of us. The book is based around interviews with a range of parents, focussed on how people organise their family life. This is rather useful since I suspect we are largely unaware of other people’s domestic arrangements, what might be possible. At times I felt Hinsliff must have been spying on us, so many things rang so true – the tensions over household chores, the boredom and frustrations of child rearing, the added stress of travelling for work with a child at home. I’d have welcomed an appendix collecting each of these stories, since as it stands they are scattered in fragments through the book. I worked 4 days a week for a while, when Mrs SomeBeans was still on maternity leave. This was a cosy arrangement but when she returned to work and I looked after Thomas by myself for one day a week – I got bored. I feel ashamed to say it but it seems from Hinsliff’s book that I’m not alone. Financially, working an extra day a week didn’t make a great deal of difference. What I gained in salary I pretty much lost in nursery charges, and would have gone completely if we’d have taken on a cleaner. This does fit with a theme of the book, people – both men and women, value working life. So even if going to work is no better than cost neutral, many people will chose to work. Hinsliff’s proposal for family life is the “half a wife” solution, a midway point between the traditional breadwinner/homemaker and two full-time employed model. The path to this proposal is not direct, it’s a combination of career, housing, childcare and schooling. A recurring theme of the book is that the family policy to support this proposal is not just for women. I like this sentiment. The career side of the problem is covered by the “z-shaped trajectory”, with the horizontals representing those times when family takes over and the career goes on hold and the diagonals when things take off. I have to say this seems terribly well organised! My career has suffered from a lack of a master plan. My earliest guide was my dad, who worked for the same organisation for his entire working life. I had a spell working on short term contracts in academia before gaining tenure, then gave it all up to work for Unilever for a period. Most recently I joined a startup in Liverpool, it’s only with this most recent move that I’ve started to appreciate that I’ve got marketable skills. The policy support here is in pushing companies to allow more flexible working, for both women and men. Housing forms another part of the jigsaw puzzle, housing costs in the UK are high, particularly where there are jobs. Long commutes to work are both bad in themselves for employee happiness, and damaging for family life. Housing is a difficult bullet to bite there is a tacit agreement that house prices are too high. But bringing them down means a large block of voters will lose out. Childcare is a second leg of the problem, I must admit I look with envy on other couples mentioned in the book who get support from conveniently located family. Schooling has some part to play here, for working families a school day shorter than a working day presents a childcare challenge. Even worse, the long summer holidays, originally designed to support the use of children as an agricultural labour force. Half a wife helps answer the question: “how do I be a grown-up?” for which I’ve never felt well-prepared. Doubly so when it came to fatherhood and how it fitted with work, and my previous life. It’s well researched and readable. I wish I’d read it before I entered adult life!